Members of the Syracuse University Department of Public Safety are giving new meaning to the phrase “to protect and serve.” Typically, DPS officers are seen on campus patrolling buildings, walkways and streets, along with responding to calls about crime. 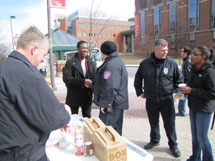 Wednesday, those same officers were in front of Sims Hall serving in a different way: handing out cups of hot chocolate along with donuts. Lebaron says this is just the beginning. Officers are planning a volleyball event during Wellness Week 2013. Their next chance to serve comes up April 2 at the Schine Student Center. They’re calling it “Wrapping with DPS,” in which officers will be handing out sandwich wraps to students and staff. All DPS asks in return is for people to let officers know how they’re doing, as they try to reach 100-percent satisfaction.